If you need to keep your company’s valuables and assets secure while moving to a new location, refurbishing or just freeing up some work space, you could benefit from taking advantage of our affordable and well-protected commercial storage units in Stoke on Trent. At Store-safe, we’ve been storing items for businesses for over three decades. Obtain free quotes and advice below or call us to discuss your requirements. You can store your office equipment, furniture, valuable assets and fragile items at our facility for as long as required, whether it’s a matter of weeks or months. If you’d rather not risk causing any damage to your items while packing and transporting, our highly trained and fully insured moving specialists can put their skills to use. We also offer a discounted collection service when you prepay for long-term business storage in Stoke on Trent. Our business storage units range in size from 40 to 320 square feet, meaning we have suitable solutions for small, medium and large companies. 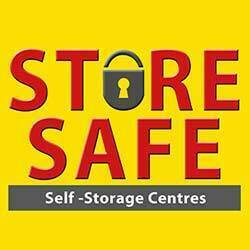 Thanks to business self-storage in Stoke on Trent, your valuable items can remain safe and sound without taking up any of your space, all for an affordable price and for as long as required. To obtain your free quote, simply provide your name, location, preferred facility location and required rental duration using the form on this page. If you prepay for six or 12 months, you’ll get a discount of up to 9%. When we’ve prepared your quote, we can send it to you by email or post. Alternatively, one of our self-storage specialists can call you to discuss your quote in more detail. If you want to talk about your options with one of our experienced advisors, don’t hesitate to give us a call on 01782 785 370. We can give you an idea of which unit you’ll need to accommodate your possessions as well as explain how we’ll keep them safe around the clock.